Should we pay for art? The motor vehicle has become the latest terrorist threat. Incidents in Nice, London and Melbourne have shown how vulnerable pedestrians are to a driver intent on making a political statement through violence. As a result, the city of Melbourne introduced concrete bollards on major city intersections to protect pedestrians. These were initially decried for their ugliness. But it was their brutal appearance that has triggered many individuals to beautify them with decoration or even cosies. This response is naturally welcomed as a form of defiance against the way terrorism can make our urban spaces feel more alien. As spontaneous gestures, such works are naturally offered without payment. It’s possible to see this as parallel to the way social media has created platforms for expressions of creativity. The largest media company in the world, Facebook, produces no content itself, and instead draws on material posted for free by its one billion users. While participatory media reflect a vibrant democracy, it can seem at the cost of specialists. Newsrooms are closing and pay for writing is declining. Musicians find that they have to make their music freely available on YouTube in order to be heard. City Councillors looking at the way the public have given colour to these grey blocks might start to think that they no longer need to pay for professional artists to decorate public spaces. Let the people colour their own city! So, would it be better if cities employed professional artists for tasks like decorating bollards, or it is better to leave them open for spontaneous public expression? Let’s know what you think. This reminds me of the temple life that is still quite active in many Asian cities. You find shrines and statues in the middle of very crowded cities that are adorned every day with flowers and gifts. There’s something quite heartening about this, as an exception to the manic business of a modern city. 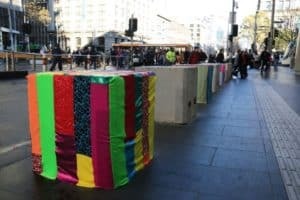 The response to Melbourne’s bollards show how that impulse for free public expression can be found in Western cities too. We should encourage it more. I am interested in how creative practice can begin to envisage a world that is not underpinned by an acceptance of capitalist values. The pervasiveness of capitalism limits our ability to imagine alternatives to the market and the forms it privileges. Enacting new forms of exchange and ways of occupying space through creative practice can propose alternative values and systems for organising the economic and cultural production of our lives and the spaces that we occupy. Giving a gift, for example taking the time to anonymously embellish a bollard for the enjoyment of the general public, is embedded in a sense of generosity without expectation of direct reward. Reciprocation is not immediate, as it is with a cash transaction or direct exchange, but instead indicates the presence of a different modality, one premised on relations of care, mutuality and living in common, rather than a system predicated on the extraction of value.